Before I went to bed last night I mixed up a batch of my famous English Muffin dough and made a quick jar of Lemon Curd . Up at 5.30 am, I formed the dough into discs and left them to rise while I showered. Baked to perfection in the fry pan, toasted and topped with butter and lemon curd, we sat down and watched the Australia Cricket team cruise to victory in the World Cup on a rather wet day in Barbados. Please support A Taste Of Yellow and LiveSTRONG Day . Do you have a favourite moose mousse? 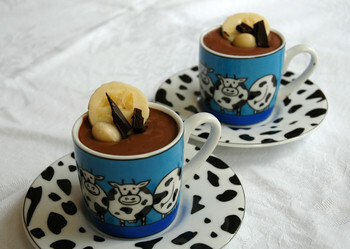 Helen has posted the mousse round up and you have until Sunday 29th April to vote for your favourite entry. I feel 5K (10 pound) heavier after reading every single entry. Every mousse entered is fabulous. How does one choose a favourite? Voting is open to anyone so please cast your vote after reading the round up by emailing marinette1ATcomcastDOTnet . I invite you all to participate in A Taste Of Yellow by baking/making anything you wish as long as it contains a yellow food. I need your entries by 7th May for the round up on 16th May to coincide with LiveSTRONG Day . My friend Jacqui thought I might like to meet her friend Gilly because guess what....Gilly has a food blog too. Drop by and say hi to Gilly at So So Simple Food. Gilly had brought a few figs along as a foodie gift. Sadly she remembered the figs as her husband drove down the road with the figs still in the car. However Jacqui had been up at her beach house and gathered a few feijoas from her tree for me. 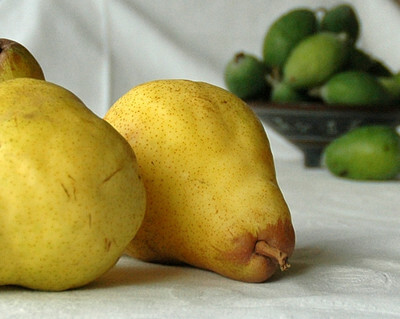 Feijoa on its own is a bit boring and I had some pears which needed eating today. You can see their skins are a perfect yellow which means sweet and juicy inside. 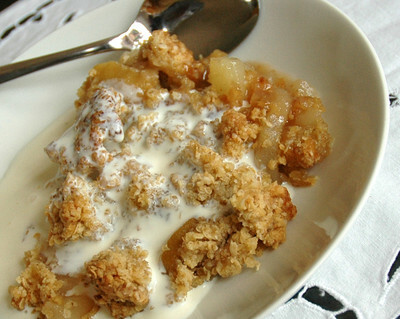 I googled feijoa cake, because that was my first thought for the feijoas, and up came my blogging friend in Ireland Caroline at Bibliocook with a feijoa and apple crumble. Perfect I could use the pears in place of the apples and kill two birds with one stone, or should that be cook two fruits with one recipe. Run on over to Caroline's for the recipe. 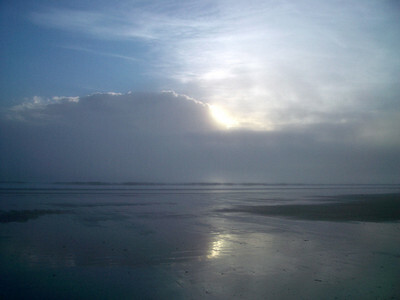 Takapuna Beach 7.30 AM 25th April, Anzac Day 2007 and 4 years today since my father died from cancer. Please support LiveSTRONG Day by participating in A Taste Of Yellow . 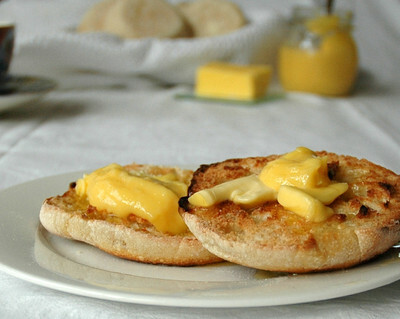 Please email (atasteofyellowATgmailDOTcom ) your post on food inspired by the colour yellow to me before 7th May . Thank you to those bloggers who have already posted their support for LiveSTRONG Day. 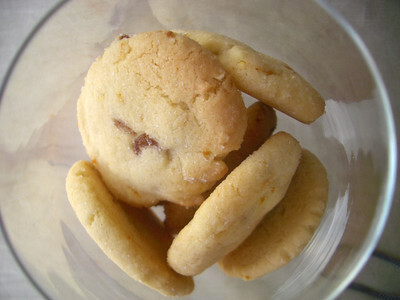 Peabody's Mum's Best Cookies in the World . I made a few changes because I didn't have any cranberries or pistachios in the pantry. I did have sultanas and macadamias. The recipe made more cookies than I wanted so baked a third of the mixture, rolled the remainder into two cylinders, wrapped them in plastic wrap and into the freezer for another day. Very nice Mumma Peabody, thank you. ...and so has Clotilde and many of her readers judging by the comments left on this post. Needing a magazine to read when I was waiting for a ferry recently I picked up an old May 2002 copy of a Cuisine magazine in a second hand book store. The cover featured an interesting photo of pots of different honey made to look like a section of honeycomb. Inside was a 4 page spread on a honey tasting conducted by the Cuisine tasting panel. It discusses the New Zealand honey industry, bees and their job description, the differences between clear and creamed honey and closes with a tasting of 20 different New Zealand honeys. This interesting passage was in the article. 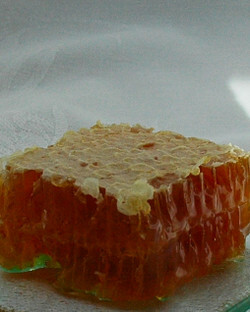 ...and honey purchased in the waxy honeycomb is a wasteful and expensive use of the bee as a resource. Once the honeycomb is built it can be used many times over, as the beekeeper merely extracts the honey from the comb which the bees build up again. Seven kilos of honey can be made in the time it takes to make one kilo of beeswax, and the bees would actually prefer to make honey anyway! So that explains why it is expensive to buy in this form or as candles. Maybe we should think twice next time we are drawn to honey sold this way. I'd be interested to hear what you think because I love honey in this form. Thanks to Stephanie I've spent, wasted, enjoyed an afternoon playing dress ups. This is how I see myself in Meez. Go dress up. You know you want to. We were parked outside Michel's Patisserie on Monday when I decided to dash in and buy a take away coffee while I waited for Bryan. 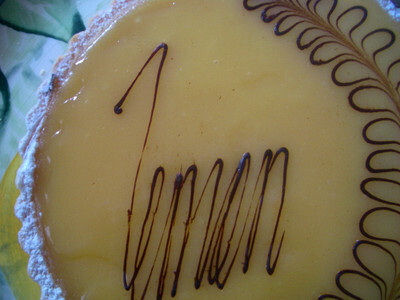 I came out carrying coffee and munching on a Pasteis de Nata, a Portuguese custard tart. 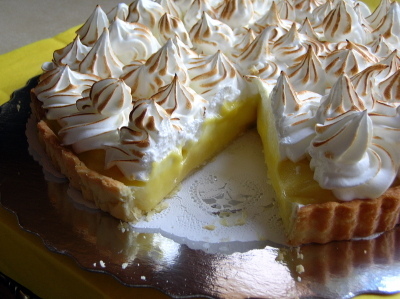 It was so good I decided to go back in and buy a lemon tart to serve to our neighbours who were coming for dinner last night. It was every bit as good as I expected. Slow roasted lamb was the main event of the evening. In the past I've always cooked my lamb (with lots of garlic, rosemary and lemon) by roasting at 230C degrees for half an hour and then turning the oven down to 160C degrees for about 2 hours. Recently I'd slow roasted a piece of pork for 9 hours and it was delicious. I wanted to do something similar with the lamb but 9 hours at home was not going to fit with my plans. I'd heard of a method of slow roasting for 5 hours at 120C degrees and thought I might try that. Sam, my favourite San Francisco blogger, had roasted a lamb and mentioned the HFW sizzle and slow method. So a quick email to Sam for the technicalities and I had my combination. A little input from Hugh, a little from Sam and a little from me. 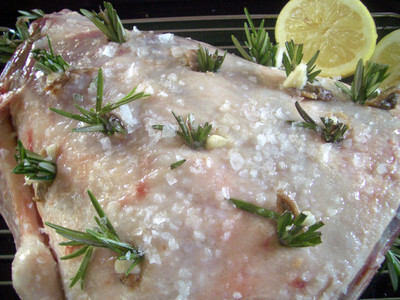 I used slivers of garlic, anchovies and rosemary to flavour the 2 1/3kg leg of lamb, drizzled it with olive oil, the juice of a lemon and a sprinkling of Maldon salt, then onto a rack in a pan with a little water covering the bottom of the pan. The oven was preheated to 230 C degrees when the lamb went in. After about 45 minutes the lamb had a nice golden crust. I turned the oven down to 100C for 1 hour and then back up to 120C for the last 3 hours, then rested the lamb for 20 minutes before carving. I added a few splashes of red wine to the juices in the pan for a gravy. Brilliant. "Figs are restorative. The best food that can be taken by those who are brought low by long sickness and are on the way to recovery. They increase the strength of young people, preserve the elderly in better health and make them look younger with fewer wrinkles,"
Pliny, Roman historian (62-113 A.D.). As a child I detested figs. We had a fig tree on the farm and there always seemed to be fig jam in the cupboard when all the other jam jars were empty. I just didn't like the taste. Amazing how our taste buds change as we become adults. Now I love figs. Bryan on the other hand has always said he hates figs. Fortunately for him there is never an abundance of them in New Zealand. When they are available in the last days of summer they are about $1.50 each so when I do buy them I keep them all to myself. Today I decided to make grilled fig and haloumi sandwiches for lunch. The figs I bought yesterday were sweet but not strong tasting, I thought he'll never notice there is fig in his sandwich. Wrong. A third of way into the sandwich he said "I hate figs". I said "I didn't think you'd notice because they aren't that strong and the sweetness of the fig goes so well with the salty haloumi". "But it's the texture I hate" he said. 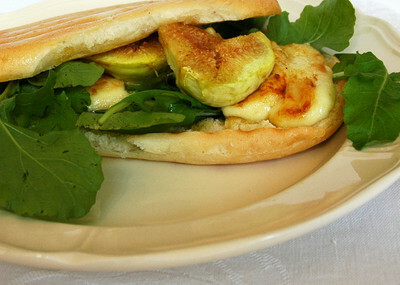 The idea for this sandwich originates with Clotilde's Fig and Mozzarella Warm Sandwich . Brush bread on both sides with a little oil. Cut figs into quarters and sprinkle with a little sugar and cinnamon. Place figs under a grill to caramelise. Grill bread on both sides. While bread is grilling fly haloumi slices in a lightly oiled fry pan until brown on both sides. Place half the rocket leaves onto one slice of grilled bread. Top with haloumi slices and figs. Cover with top slice of grilled bread and serve immediately. Helen , the winner of Hay Hay Its Donna Day #10, has chosen mousse has her theme for Hay Hay Its Donna Day #11. 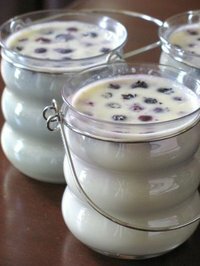 Helen has posted the Donna Hay recipe for Blueberry and White Chocolate Mousse as the starter for the event. I halved the original recipe, replaced the white chocolate with dark, removed the blueberries and added bananas and macadamia nuts for my version. It is quite rich so an espresso cup serving was just perfect after our family Easter celebration lunch . Place water in a bowl and sprinkle gelatin over it. Let stand until the gelatin absorbs the water. Place 2 1/2 ozs of the chocolate and cream in a saucepan over medium-low heat. Stir until smooth and chocolate is fully incorporated. Add the gelatin mixture and stir for 1 minute to dissolve. Whisk for 3 minutes or until cooled. In serving cups place several pieces of sliced banana, a teaspoon of macadamia nuts, and a few slivers of the remaining 1 oz of chocolate. Refrigerate 45 - 60 minutes to set. Decorate with extra bananas, nuts and chocolate slivers. I used Lindt 70% cocoa chocolate which I like. The family would have preferred a sweeter version. You could add a tablespoon of honey and heat with the milk and chocolate. It would make a slightly sweeter version. Post your own Hay Hay Its Donna Day mousse and email the details to Helen. You must post your mousse recipe no later than April 20th. Once your post is up, email it to Helen at marinette1 AT Comcast Dot net, including your name, name of your blog and its URL, title of your recipe and URL to your post, a picture of your mousse. The round up will be posted and voting will begin on April 24th, and the winner will be announced on May 1st. The winner will receive this book by Trish Deseine and of course the chance to host HHDD #12! On Easter Saturday we avoided the crowds at the Waiheke Island jazz festival and instead went to the quieter alternative, the Rakino Island Jazz Picnic . Rakino is a tiny island out past Rangitoto with only 11 permanent residents. Access is by private boat. However on this day Fullers had provided two ferry sailings to get us there and back. We went over on the 10.30 and returned on the 6pm which made the day just a little too long. The 3.30 return was a bit to early so a 5PM ferry would make more sense. There are no shops on Rakino so most people take a picnic lunch but there is limited food available on the day. The usual sausage in a bun kind of stuff. The event is licensed to sell liquor and have a small (very small) selection of wine and beer. When we arrived there was sign saying no BYO which everyone ignored. We had taken a rather nice reisling and when that was all gone we had no choice but to purchase a bottle from the drinks tent. Here are a few photos taken on the day. Click on any to enlarge. White chocolate and blueberry mousse. How good does that sound. Helen the wonderful baker from Tartlette who made those in the above picture, is our host for Hay Hay Its Donna Day #11. She has chosen mousse as her theme. Drop by and say hi and get the Donna Hay Mousse recipe and all the details for this months challenge. Our family didn't follow the strict Catholic rule of no meat on Fridays. Although we did make the effort on Good Friday and we would have fish for dinner. Since I left home I have been particularly vigilant and always avoided meat on Good Friday. Except this year. 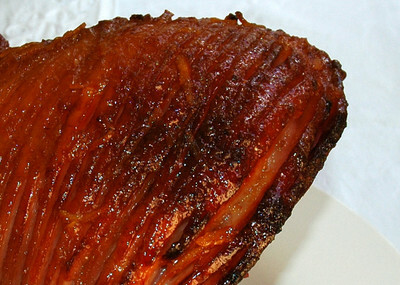 Our usual family Easter celebration is always a glazed ham for Easter Sunday lunch. This year we had to bring it forward a few days and have lunch on Friday. Michael was flying out to London Friday evening to visit friends so Sunday lunch became Friday lunch. I could have served fish but the rest of the family if given the choice would prefer ham to fish. I buy a half leg for and by the time it is all gone we will have eaten enough ham to last us until Christmas, when we will have a glazed ham for Christmas Eve. Easter Sunday lunch and Christmas Eve dinner are always the same. Glazed ham served warm with a potato salad and a green salad. Remove skin from ham being careful to leave the layer of fat. Score ham with a sharp knife through fat without cutting into meat. I use lines because I prefer the look. Most people score in a criss cross pattern creating a diamond shape which results in little pieces of crispy glaze. I like big long strips of crispy glaze. I never use cloves because I hate biting into a clove unexpectedly but most people stud the ham with cloves. Place ham in a baking dish lined with parchment paper. This makes cleaning up easier. Paint ham with a third of the glaze. Place ham in oven and bake for 20 minutes. Remove from oven and paint a second coating of glaze over ham. Bake again for 20 minutes. Remove ham and paint with the remaining glaze. Bake for 20 minutes. Turn oven off and let ham sit in oven until ready to serve. If you start baking the ham two hours before you sit down to lunch it is the perfect temperature when you are ready to eat. 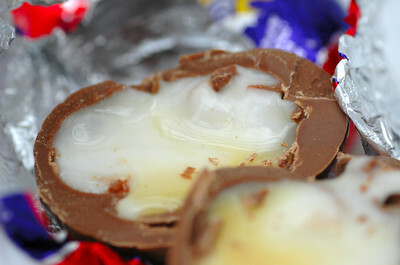 Mmmm - Creme eggs. Have a great Easter everyone. Is it just me or can you see the face of a cross bunny who has lost his ears? When Sam sent out the challenge to make our own hot cross buns I decided to rise (oh that's witty) to the occasion and have a go. I decided to go with Delia's recipe as I had milk in the house and knew if I wanted to buy fresh yeast it would take me all day to find someone to sell it to me. Unlike the engineer I didn't bother with the paste crosses. My slashes in the top were not perfect so the cross is not well defined. Also as I was about to add the mixed spice I discovered I didn't have any in the cupboard so mixed 1/2 teaspoon each of nutmeg and cinnamon. 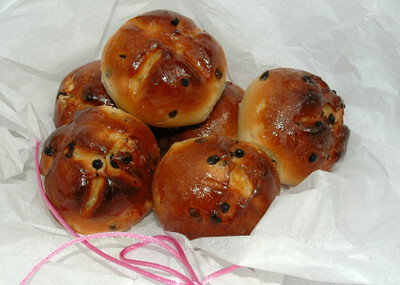 I agree with the engineer they don't taste like a store bought bun but I ate two as soon as they came out of the oven. I like them. I've put them in the freezer with the plan to bring them out Sunday morning and defrost them. But I'm thinking I will make some dough Saturday night and rest it in the fridge overnight and make fresh buns Sunday morning. I now have the mixed spice so they should taste more authentic. 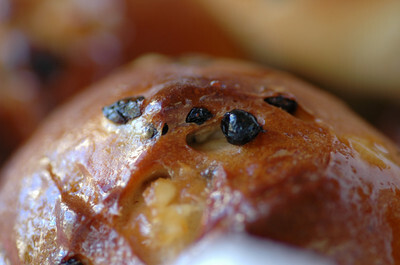 Pascale and Clotilde have both made adapted versions of Delia's recipe. There seems to be some problem with linking with Delia. You may need to Google it. How could I not participate in this event . When I saw Helene post about it I dropped by Melecotte to find out more. I was diagnosed with cancer while holidaying in Portugal in June 2004. It is almost three years since my life changed and hospitals and doctors rooms became the places I seemed to be spending a fair amount of my time in. Bars, restaurants and vineyards became non existent in my life. There are days where I long for my old life. I'll never have that old life back now. The chemotherapy has altered my taste buds to the extent I'd have to develop my palate all over again. Some days I have trouble telling the difference between a pinot gris and a Riesling. Last night we dropped by a bar after the movies . I was so convinced the Riesling I'd ordered was Sauvignon Blanc I asked the waiter to check the bottle. I can't believe my tastebuds are that bad so I'm going back with a former colleague for a second glass and to get her opinion. The secret to surviving cancer is catching it early. Check with your doctor for when it is appropriate to have the various tests available. If you have lost a family member to cancer be especially vigilant and have those tests. Even if you say to your doctor "my Dad's oncologist says I should have a test for colon cancer" and your doctor says "how old was your Dad when he was diagnosed ?" and you say "78", and your doctor says "you're only 50 you don't need it for another 10 years" . So you don't have the test because you trust your doctor and 3 years later you're diagnosed with colon cancer and it's harder to fight because it is more advanced. Now I've always been a foodie and I've exercised and stayed healthy all my life. I have never been a big fast food or junk food fan so I know my diet is not responsible for my cancer. Some cancers are genetic which is why the tests are important if cancer is in your family. Healthy eating is one of tools in my bag for fighting the cancer, along with meditation, positive thinking and exercise. I start every day with a bowl of porridge with fruit and nuts. In a medium saucepan mix oats, water and salt. Cook over a medium heat until ready. Add nuts, sultanas, grated apple. Add milk or yogurt if desired. I don't add sugar but if you want a bit of sweetness drizzle a little honey over. This amount will serve two - three people. 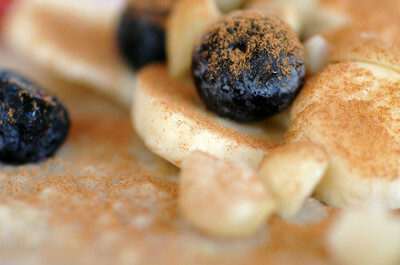 There are ten foods we should eat often for a healthy life. They are oats, red apples, dark chocolate, blueberries, macadamia nuts, tomatoes, salmon, yogurt, garlic, broccoli. To read more about fighting cancer with diet read Foods That Fight Cancer by Richard Béliveau and Denis Gingras. Sign up with Lance and see how you can help raise awareness. 1. Becks and Posh I've always been a label reader when I shop but Sam has made me push myself just a little bit harder to question where my food comes from and to eat local as often as I can. 2. I'm Mad and I Eat She's not really mad in the insane sense you know, just a bit of politics mixed into her food posts. Cookie Crumb is into the eat local thing too. 3.Nordljus Keiko's blog was one of my early blog discoveries. She has an eye for capturing photos from angles most of us wouldn't consider. She constantly inspires me with her attention to detail when she cooks and her artful way with her photography. 4.Jam Faced I've been reading the writings of Monkey Gland since his first post. He is serious about his food, has a great sense of humour and isn't afraid of talking about what happens when you eat bad food. 5.A Blithe Palate Cath doesn't get to post as often now she has baby Puggle to take care of, but a few of her most memorable posts cover love , death, fathers and a visit to the British Museum. I've nominated you for this award consider yourself tagged only if you want to accept the challenge. 1. If you wish, write a post with links to 5 blogs that make you think. 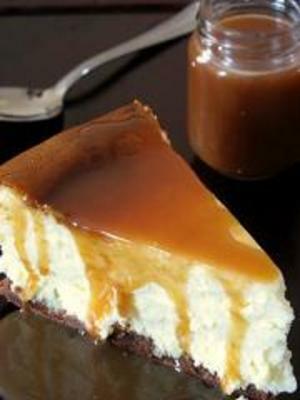 You have voted this yummy Pillow Cheesecake with salted butter caramel sauce from Helen at Tartlette the winner of Hay Hay Its Donna Day #10. Congratulations Helen and I'm looking forward to Hay Hay Its Donna Day #11. I'm sure it will be fun. Thanks to everyone who entered and a big thank you to Peabody for hosting HHDD#10. Drop by and say hi to Helen and see her plans for the next event.